Connect, commiserate, talk about treatments for your disease // create a web of words // leave a trail for researchers to comb for clues. For Sandy45 and Elaineb2, both coping with advanced lung cancer, trading information about treatments and startling symptoms has become part of a reassuring routine. What they learn from each other, and from other members of their online group, may go beyond what they’re able to find through other sources. If they checked the safety information on the manufacturer’s site for Tarceva (erlotinib), for example, they’d learn only that “bullous, blistering and exfoliative skin conditions have been reported, including cases suggestive of Stevens-Johnson syndrome/toxic epidermal necrolysis, which in some cases were fatal.” Nowhere on the official site would they discover the notion, relayed from Elaineb2’s oncologist, that such side effects in a mild form might be a welcome sign. Members of Inspire take part in discussion groups on hundreds of diseases and conditions, and it’s obvious how much participants depend on one another for information, inspiration and support. But all of their online “talk,” which generates some quarter-million words a day, may have another use as well. It’s a giant pool of glimpses into patients’ everyday lives—glimpses that aren’t gathered with the tools traditionally employed by researchers, who conduct studies according to strict observational protocols, with painstakingly calibrated surveys. Still, some scientists have begun to explore ways to mine this ever-deepening vein of online content. Social networking sites, unchecked by authorities, are fertile ground for misinformation and unscientific experiments. 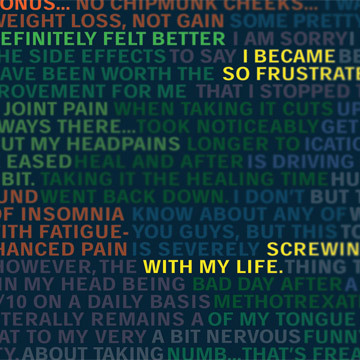 Patients on medical networking sites share symptoms and support. Here, they also share their stories. 1. “Learning From E-Patients at Massachusetts General Hospital,” by John Lester et al., British Medical Journal, May 15, 2004. A summary of how people behave and what they share in online medical forums, and an early recognition of Internet communities by the medical establishment. 2. “PatientsLikeMe: Consumer Health Vocabulary as a Folksonomy,” by Catherine Smith and Paul Wicks, AMIA Annual Symposium Proceedings, November 2008. An overview of how members of online patient community PatientsLikeMe talk about disease, the article describes how their informal language structures can be classified—a necessary first step in analyzing them.